Not to be confused with Goliath grouper. "Brown spotted cod" redirects here. For the Southern African fish, see Brown-spotted rockcod. For the Persian Gulf fish, see Brown spotted reef cod. The giant grouper (Epinephelus lanceolatus), also known as the brindlebass, brown spotted cod, or bumblebee grouper, and as the Queensland groper in Australia, is the largest bony fish found in coral reefs, and the aquatic emblem of Queensland. It is found from near the surface to depths of 100 m (330 ft) at reefs throughout the Indo-Pacific region, with the exception of the Persian Gulf. It also enters estuaries, such as the lowermost part of the Brisbane River. It reaches up to 2.7 m (8.9 ft) in length and 400 kg (880 lb) in weight. Giant groupers feed on a variety of marine life, including small sharks and juvenile sea turtles. Due to overfishing, this species has declined drastically in many regions, and as of the mid-1990s. It is considered Data Deficient by the IUCN. This giant fish is similar to the Malabar grouper, and its colour changes with age. The giant grouper has a large mouth and a rounded tail. Juveniles have irregular black and yellow markings, while adults are green-grey to grey-brown with faint mottling, with numerous small black spots on the fins. 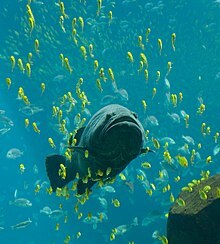 The first fish to undergo chemotherapy was Bubba, a giant grouper at the Shedd Aquarium in Chicago. Like most groupers, giant groupers are protogynous hermaphrodites (all are born female, but some become male when few males are present). They spawn on a lunar cycle, with spawns lasting about 7 days. They are aggregative broadcast spawners, usually with several females per male. Studies in captive populations suggest that the dominant male and female begin the spawning event as nearly the only spawners for the first day or two, but other members of the aggregation fertilize more eggs as the event progresses, with even the most recently turned males fathering offspring. Unlike males, where one male is dominant across spawns, the dominant female of an aggregation seems to change from month to month. ^ a b Fennessy, S., Pollard, D.A. & Samoilys, M. 2018. Epinephelus lanceolatus. The IUCN Red List of Threatened Species 2018: e.T7858A100465809. https://dx.doi.org/10.2305/IUCN.UK.2018-2.RLTS.T7858A100465809.en. Downloaded on 25 December 2018. ^ "Giant Queensland groper" (PDF). Department of Primary Industries. State of New South Wales. July 2006. Retrieved 2018-02-03. ^ a b Froese, Rainer and Pauly, Daniel, eds. (2012). "Epinephelus lanceolatus" in FishBase. May 2012 version. ^ "'Bubba,' Famed Cancer-surviving Grouper, R.I.P. ; 'Overcame Some Incredible Odds'". Underwatertimes.com News Service. Underwatertimes. 2006-08-24. Retrieved 27 May 2012. ^ Bright, David; Reynolds, Adam; Nguyen, Nguyen H.; Knuckey, Richard; Knibb, Wayne; Elizur, Abigail (June 2016). "A study into parental assignment of the communal spawning protogynous hermaphrodite, giant grouper (Epinephelus lanceolatus)". Aquaculture. 459: 19–25. doi:10.1016/j.aquaculture.2016.03.013. Wikimedia Commons has media related to Epinephelus lanceolatus. This page was last edited on 7 February 2019, at 17:27 (UTC).